Your dieting mindset is what’s causing your ‘All or Nothing’ eating in the first place. But, it’s actually this mindset of restriction that’s screwing you over. And in a minute, I will tell you why. I used to be an ‘all or nothing’ eater too. There was noooo way I could have just a little bit of ice cream, chocolate, cookies, you name it. Everyone’s story is different, but I got to this place because I used to over-exercise. Since I hated my body so much (and myself because I saw myself AS my body) this caused me to abuse exercise. This over-exercising made me overeat. I couldn’t control what I was putting in my mouth after I worked out because my body NEEDED the calories. It’s these words right here that cause us to lose control with food. We think that by saying “You’re so bad”it’s going to make us avoid that food in the future. When in reality it just makes us want it more. I now have a healthy and happy relationship with food. And this is what I want for you too. The dieting mindset is one of restriction. This is just what diets are about and what they teach people to do. So, it’s not your fault that you ended up in this place. But, you’re here nonetheless. When you’re having a food that you’ve labeled as “bad,” you’re telling yourself you’re bad for eating it. I understand, you’re saying this to try and avoid eating more of this food, or eating it again in the future. But, guess what? By saying this, you’re doing the exact opposite. So, the very thing that you’re saying to yourself to avoid your ‘All or Nothing’ eating, is what’s setting you up to do it again in the future. Meaning, these thoughts are creating a fear of not being able to have this food in the future. And this fear is what makes you eat all of it in the moment. And I know you know this happens, because you see it happen over and over again! How I Overcame My ‘All or Nothing Relationship with Food and How You Can Too! Meaning, the quality of person I was had nothing to do with the foods I choose to eat. Which means there are certain foods we live on and others we don’t. Just because a food is less healthy doesn’t mean it can never be eaten (even if you want to lose fat.) It just all comes back to how much of this food you’re eating in total. And this is why we want to get rid of the good and bad labels. Because this is what makes us lose control over how much of this food we’re going to eat. The dieting mindset is so black and white...and the world we live in is not black and white. It has a lot of gray. Meaning, there’s a lot of ebbs and flows in real life. And just having a bunch of rules telling you want you can and cannot do doesn’t work in the real world-because it’s always changing. You need tools on how to deal with cravings and the ebbs and flows of real life. Right now, the food is in control. Not you. The way your mind is currently wired to think about food is what’s giving food the control. You want to change the way you think about/interact with food so you can be in control. Telling yourself a certain food is off limits or that you’re never going to have it again is not reality. And it’s going to make you want to do the complete opposite of what you’re trying to do. How Brainy Betties Helps You Overcome Your ‘All of Nothing’ Eating and Take away the Stress so you can be Fit AND Happy! Having a great relationship with food isn’t just about overcoming ‘All or Nothing’ eating. It’s about taking the stress away from eating and learning how to eat in a way that maximizes your unique body, likes, and life. And to do this, we need to talk about A LOT of different things other than just fitness. One of these things is food, and the relationship you have with it. 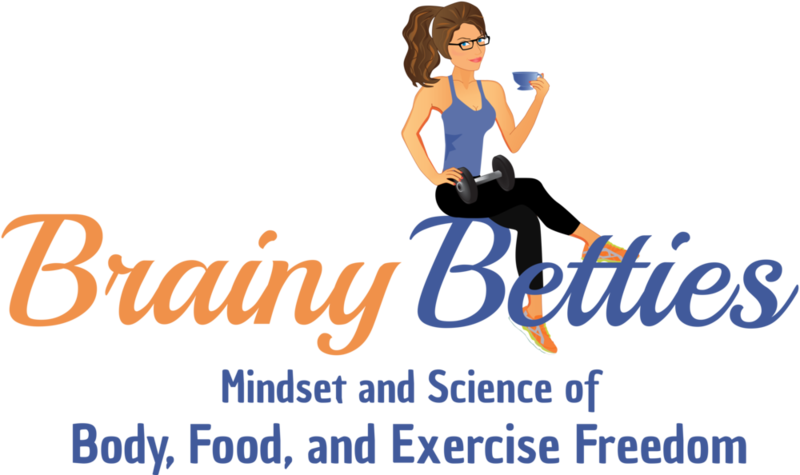 Brainy Betties is not only small group fitness training for women, but an educational program to help make you Fit AND Happy. What does Being fit AND Happy Feel like? It’s a state of caring for yourself and your body that is surrounded in self-care (love for yourself.) Not one of hate and trying to constantly hate yourself into change. It’s having the fitness level you want while also loving the life you’re living. Becoming fit AND happy elevates your life in ways you never knew possible. Not only will you live in a non-obsessed (happy) state, but you live in a state of love for yourself. This love and active care for yourself is what takes your life to the next level. Your next level of living. Click here if you want to end your 'all or nothing' relationship with food so you can be fit AND happy!